A team from the ICD had the pleasure and privilege to interview His Excellency Elyes Kasri, ambassador of Tunisia to the Federal Republic of Germany. This interview allowed to us gain a deeper insight into the nature and history of German – Tunisian relations as well as the His Excellency’s diplomatic work. In this era of globalization, Ambassador Kasri stressed the important role of communications technology to widen cultural diplomacy to include civil society at large. Ambassador Kasri’s motivation to pursue a diplomatic career stems from his passion for history, geography and his avid curiosity for other cultures, which he cultivated from a young age. Studies in philosophy, international politics and sociology in Paris and Washington further strengthened his interest in intercultural communication and international affairs. His Excellency Kasri boasts thirty-seven years of experience in diplomacy, with four ambassadorships in both Asia and Europe. Hailing from Tunisia and having lived in Asia, Europe and North America, His Excellency discussed with us the importance of being able to communicate cross-culturally, by understanding and correctly conveying the needs of one culture to another. The Ambassador shared with us his own vision of cultural diplomacy and how it guides the Embassy’s promotion of Tunisian culture here in Berlin. The Tunisian Embassy is a regular participant in the city’s annual Carnival of Cultures, in which they aim to increase appreciation for Tunisian culture. According to His Excellency, “such a modern vision of intercultural communication and cooperation helps to strengthen ties between nations and democratic systems by inculcating in people the desire to undertake cooperation programmes and appreciate different cultures’ outlook on the world”. However, for Ambassador Kasri, “cultural diplomacy is not just an exchange of folklore, but a wider range of possibilities of communication between nations and countries”. Reiterating the rising importance of civil society in a globalizing world, the Ambassador noted that, “civil society is becoming a crucial actor in nations’ transformations, not only economically and politically but also as an expression of people’s desire to reposition themselves in the world, vis-à-vis their own culture and those of others”. Taking the example of Tunisia’s peaceful democratic transition, the Ambassador observed civil society’s pivotal role in the rising democratic trend across the world. A recent example of cultural diplomacy by the Tunisian Embassy was the annual meeting of the European Academy of Women in Business and Politics’ Berlin Chapter. The event was centred on the theme of ‘Democracy needs Women’ and allowed German and Tunisian women working in a variety of domains to exchange their experiences. Interestingly, Ambassador Kasri noted that the event contributed to “building bridges between women from both societies” and showing that “Tunisian women face the same impediments as German women in having political and social roles”. Striving to be a catalyser of German–Tunisian cooperation, rather than an actor itself, the Tunisian Embassy in Berlin encourages the participation of the Tunisian diaspora by helping a wide range of actors to organise events fostering stronger German–Tunisian cultural cooperation and understanding. 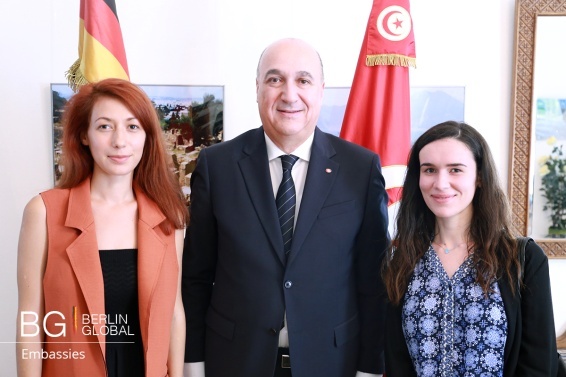 Though cooperation between both countries is strong, Ambassador Kasri shared with us the possibilities for an even stronger relationship between Germany and Tunisia. In light of its recent and ongoing political transformation, Tunisia is looking to Germany’s experiences and expertise in decentralization and local democracy, with a strong focus on women’s participation – at both the local and national levels. According to Ambassador Kasri, “reconstruction, regional integration, local democracy and education” are the four main areas of Tunisian–German cooperation. Tunisia is looking at Germany’s successful reunification at the end of the Cold War in order to reintegrate its neglected areas into the social and economic mainstream of the country. The Ambassador reiterated that Germany is a crucial source of knowledge in areas of capacity building, decentralization and developing a knowledge-based economy for a country like Tunisia, whose biggest challenge now is to create socio-economic stability and prosperity for its citizens. In the field of education, an agreement was signed on 4th January 2016 between the German government and German and Tunisian universities to establish a German university in Tunis. This collaboration will allow a transfer of skills, knowledge and expertise and simultaneously build a stronger and closer relationship between German and Tunisian societies. The kind of diplomacy that the Tunisian Embassy is trying to implement throughout Germany targets the involvement of communities by concluding twinning programmes between German and Tunisian cities. By 2020, the Ambassador aims for “each German Länder to have one or two cities twinned with Tunisian cities”. “A twinning program is a window onto the outside world, helping local communities to learn to take charge of their own development, in terms of city and local management, generating activities that take advantage of local knowledge as well as geographical and cultural assets”. Such a programme will serve to encourage cooperation between communities and strengthen intercultural understanding. In conclusion, H.E. Kasri shared with us some valuable words of advice and encouragement. “A diplomatic career is both challenging and exciting, however it requires the ability to adapt to many countries’ cultures, which are not static, but always evolving”. The ability to adapt also means being able to “step into another’s shoes and more precisely into their Weltanschauung”. In sum, the ability to adapt and adjust, having a strong sense of curiosity and empathy are essential for a successful and exciting career in diplomacy.